Asset Management allows for strong integration with Sage Accpac Accounts Payable. This feature allows user to select invoices entered in Accounts Payable and bring the balance and information into the Asset Management module. User will enter their asset invoice transaction entry as normal in Accounts Payable module. Then from within the Asset Management module the user adding an asset will now have a finder to the Accounts Payable invoice to retrieve in the details. This allows for separation of duties between Accounts Payable and Asset Management without rekeying the information. Prioritize payments, negotiate terms, and keep 1099 and Contract Payment Reporting System (CPRS) information for vendors that are subject to 1099/CPRS reporting—all in a timely manner. Facilitates rapid entry of vendor invoices, flexible cash disbursement, and full check reconciliation using Bank Services. Import and export transactions from other applications, create reusable templates and use advanced import/export options to update or replace recurring payables and terms codes. Seamless connectivity between the accounting back-end with SageCRM ensures user has detailed vendor and supplier information on hand— even when they are on the road, as mobile functionality is built-in. Norming Asset Management is developed in the latest Sage ERP Accpac Software Development Kit, has the same look, feel, level of integration as the Sage ERP Accpac core modules. Asset transactions generates General Ledger batches automatically. Integrates with P/O to streamline the asset acquisition and invoicing process. Integrates with I/C for asset acquisition, disposal and maintenance. 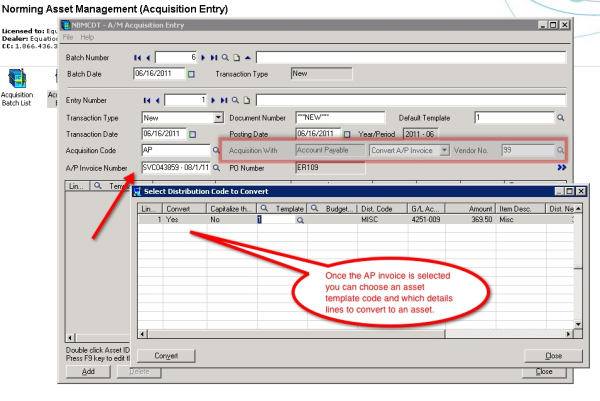 A/P invoice can be created from asset acquisition batch automatically. A/R invoice can be created from the asset disposal batch automatically. A/P invoice can be created from asset maintenance batch automatically. A/R invoice can be created from asset lease billing entry automatically. Transfers the asset depreciation expense to PJC Contracts/Projects. Drill down from G/L,A/P and A/R to originating asset transaction.